Moe took home an award of merit at Westminster Kennel Club Dog Show. Moe (not his full name), Vineyard resident and recent first time father, snuck away from his lady friend Onya and their nonuplets, for a little action in New York city on Valentine’s Day. But it’s not what you think. GCH CH Radio Ranchs Troublemaker DS, aka Moe, went to Gotham to compete in the 141st annual Westminster Kennel Club Dog Show. Westminster is the Kentucky Derby of dog shows, the second longest continually held sporting event in the U.S., two years short of the aforementioned Derby. Every pose and strut is chronicled in the New York Times sports section, and presumably on the bulletin boards of obedience schools across the country. The latter rounds of the competition are held at Madison Square Garden and televised nationally. In an age when Denver the “guilty dog” gets over 100 million views on YouTube, and it’s not uncommon to see pets pushed in baby carriages, Westminster dogs are mini celebrities. Or in Moe’s case, full size celebrities, since he is a 125-pound Rottweiler. 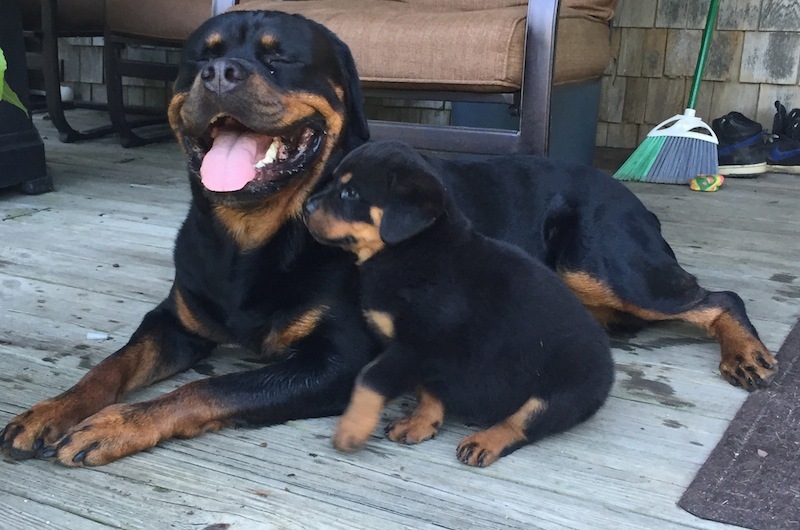 Rottweilers are named for a town in southern Germany, where the breed became famous in the 18th century for its prowess herding and guarding nomadic cattle. Many believe Rottweilers actually date back to ancient Rome, and came north with Roman Legions, who traveled with herds of cattle — a self-propelled source of fresh food in a time before refrigerated trucks. Despite his heritage and daunting size, Moe is far from imperious. During our time together in the lobby of the Hotel Pennsylvania, across 7th Avenue from Madison Square Garden, strangers regularly asked to take pictures of or with Moe. He readily obliged, save for when he smelled something interesting (his owner Sean Flynn’s word), which would cause him to face the smell and inhale deeply, producing the porcine sounds that had earned him the nickname Piggy around the Flynn household. For the past two years, Sean Flynn has been training dogs full time — his charges range from slipper chewers to prize winners — and to show Moe. The latter is nearly a full-time job itself, three to four weekends a month, 11 months a year. Since the shows don’t take place on the Vineyard and show dogs are not subjected to the indignities of air travel, that’s a lot of time in the car, with one unusually large head hanging out the window. Sean’s family has a bit of history, in the grander sense, in the dog business. His grandfather was a breeder in Osterville, and sold President Kennedy his first dog, the Welsh terrier, Charlie. JFK was known to enjoy swims in the pool with Charlie, and evening strolls where Jackie would join them outside the grounds of the White House, all three incognito. Moe is now two and a half years old, and did most of his training when younger, thus when not competing he spends time at home much like any other dog. 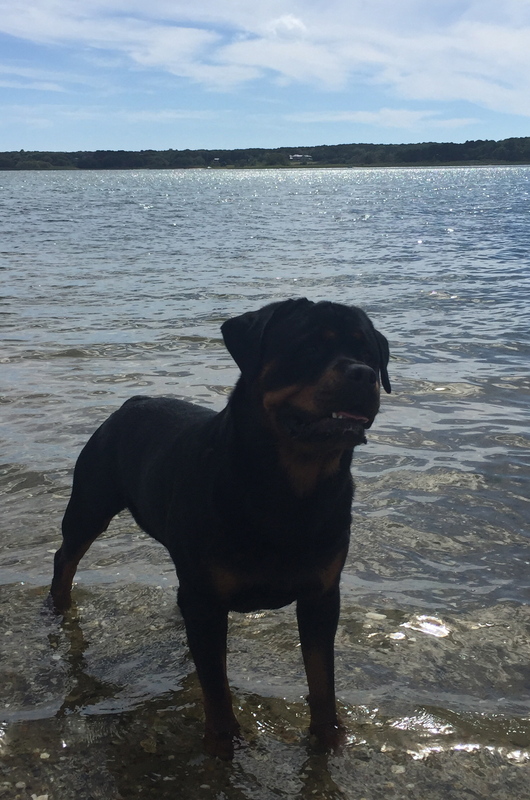 He enjoys swimming, long walks and being a beta dog in Flynn’s pack of four Rottweilers. You may have seen Moe walking the streets of Edgartown, or if you are a student at Rainbow Place Preschool you may have met Moe there. Sean’s wife Rebecca Donnelly teaches at Rainbow Place and on occasion brings Moe in to meet the children. Moe’s favorite activity is dock diving, which entails diving off a dock. It is an increasingly popular competition at dog shows, longest distance in the air wins, and Moe has won twice, with a personal best of 20 feet. You won’t have the pleasure of seeing Moe dive off local docks, though, as something that large launching itself that far needs to be done in a controlled setting. Despite stringent qualifying requirements for Westminster, there were still over 2,800 dogs competing across 200 breeds for this year’s tournament. Each dog would first face off against its own breed, the winner advancing to face other breed winners in their group. Rottweilers are in the working dog group, which includes 30 breeds, ranging from Akitas to Tibetan Mastiffs. The seven group winners would then compete for best in show. Sean often serves as Moe’s handler at competitions, but for Westminster he decided the honors would go to Valerie McGraw of Warners, N.Y. Valerie knows Moe well, having handled him on occasion in the past. Moe is a big fan of Valerie’s, and given her relative scarcity in his life, thinks of her as a special treat. Sean and Valerie felt that might be the edge Moe needed to do his best on Tuesday. Tuesday morning at 9 a.m., team Moe arrived at Pier 94 on Manhattan’s far west side. Moe was in a buoyant mood, anticipating the chance to perform with Valerie. At 10:15 a.m., Moe and Valerie entered Ring 7, along with 16 other Rottweilers and their handlers. They formed a single file semi-circle around the perimeter, nose to tail. Handlers fidgeted with treats and leashes while dogs idled, awaiting the start. At that very moment the Westminster live stream went down, and Moe’s fans urgently texted Sean for information on where to watch their guy perform. Owners and fans in attendance quickly set up Facebook live streams, and the crisis was averted as Sean Face-timed the proceedings to Rebecca back home. On the judge’s command, dogs and handlers trotted in formation, a lap around the ring in single file, then stopped at their original spot awaiting individual inspection from the judge. Dogs unattended by the judge were spritzed, wiped and combed. You and I may not notice the difference a combing can make on a Rottweiler’s very short coat, but that’s why you and I are just armchair judges. When Moe’s time for inspection neared, he stood tall and still. Valerie positioned his back paws just so. The judge arrived, opened Moe’s jaw, looked him in the proverbial mouth, then examined his back and haunches. Moe and Valerie set off on a trot, fore and aft, under the watchful eye of the judge. Once back in front of the judge, for the piece de resistance, so to speak, Valerie tossed a morsel of chicken a few feet from Moe, who eyeballed it, but did not budge. 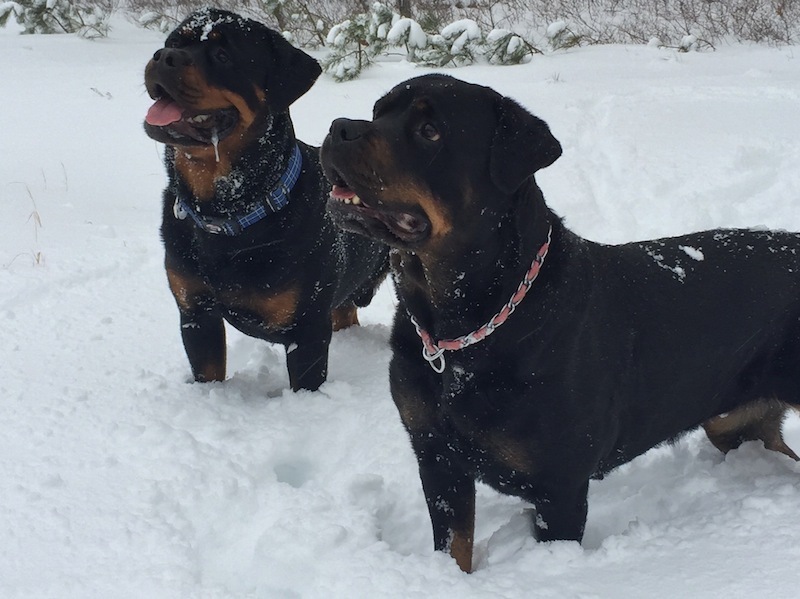 Once all 17 Rottweilers had gone through similar paces, the time for deciding had arrived. The judge held her cards close to her vest, glancing at each entry. Then, with no warning, pointed to one dog, then another, then Moe — and just like that he was part of the seven-dog final. For the finalists there were more inscrutable looks from the judge, another lap and more looks. 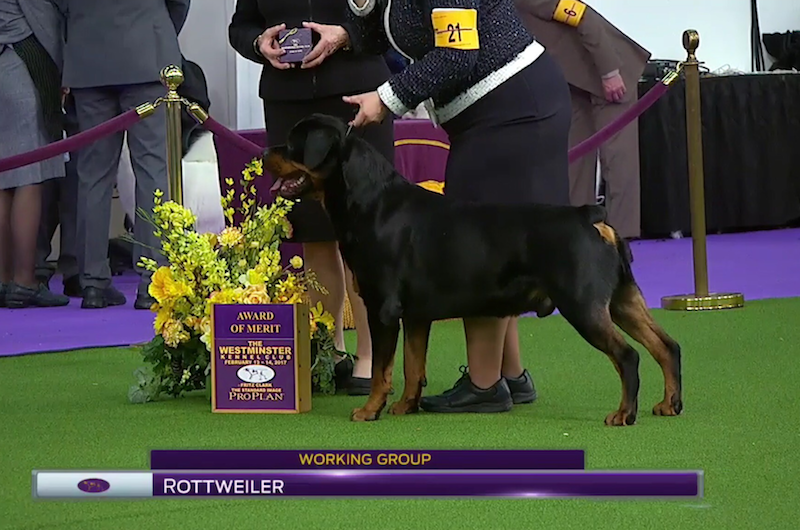 Then with no ado, the judge pointed to Rico, the North Carolinian who is the number one rated Rottweiler in the country, and was now Westminster 2017 best of breed. 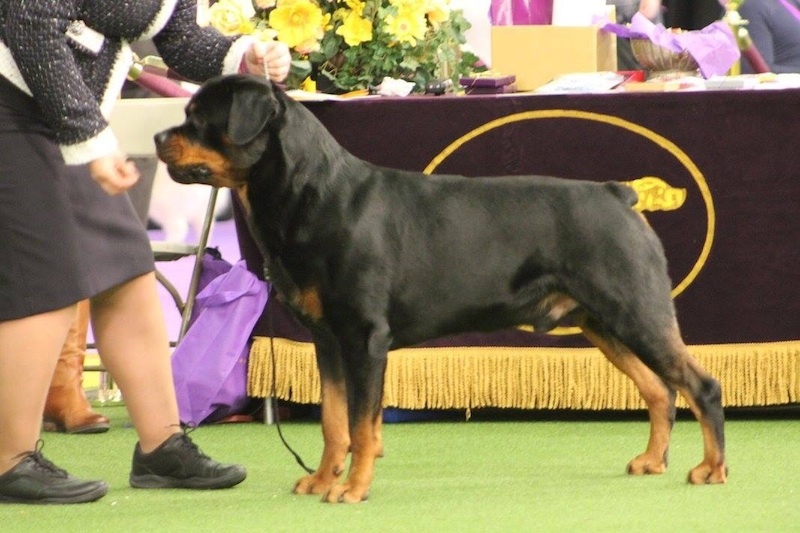 The judge then pointed to Rico’s litter mate Max as the runner up, and then to Moe and one other, who received Awards of Merit — quite an accomplishment at the de facto Rottweiler national championship. That evening Rico was bested by a Boxer, who advanced from the working group to take on the other six group winners for the grand prize. A German Shepherd named Rumor, the beaten favorite in 2016, had forestalled retirement a year to give it another try, and in 2017 she had her day, Westminster Best in Show. At two and a half years old, Moe is a long way from retirement, and plots a return to Westminster in 2018 for another bite at the Apple. Moe is gorgeous! Great story, thank you! Will be looking for Moe next year. Thank you for this fabulous piece, Mr. Crisanti. Are you the same David Crisanti who was an all-American wrestler at Princeton in the 1980s? What are some skills or traits that are common to being one of the best wrestlers in the country and one of the best dog show writers? Please keep publishing here! Really enjoyed this article David, Thank you! I've been a fan of the Westminster Dog Show since I was a kid, fun to learn about one of the contestants!